Over 200 young ski racers and their families will come to McCauley Mountain on Friday, Saturday, and Sunday March 1, 2 and 3 to take part in the Kandahar Ski Race hosted by the Polar Bear Ski Club. The weekend will start off with a racers’ training day on Friday followed by a Friday evening Meet and Greet for racers and their families, hosted by Nick Bankert and Felicity Davey at the Last Run Café. The showing of Warren Miller’s ski movie “Flow State” will be presented at View on Friday and Saturday at 7 p.m. Tickets are $8 and available at View’s box office. A buffet spaghetti dinner will be held Saturday night at View from 6 to 7 p.m. The cost of the dinner with film ticket is $12 in advance or $15 the day of the show. This entry was posted in admin on February 28, 2013 by Wende Carr. Inlet’s Cousins That Care, back row, from left, Shawn Hansen, Shelby Townsend, Founder Melanie Levi, Britney Levi. Front Row, Cory hansen, Thomas Levi. Couputer in foreground waiting to Skype. The Cousins that Care, the seven Inlet cousins who raise money for special causes, were among eight recipients of a Charlotte Bacon Act of Kindness Award through the recently created foundation, Newtown Kindness. The Newtown Foundation was created by Aaron Carlson whose six-year-old daughter, Ava, was close friends with Charlotte Bacon, a victim of the Sandy Hook Elementary School shootings in Newtown, CT on December 14, 2012. 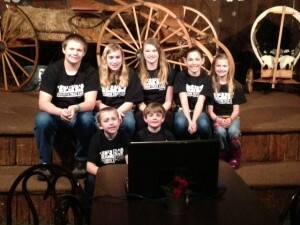 The cousins received the honor via a Skype presentation during the inaugural awards ceremony that took place in Newtown, CT on Friday, February 22. Their nomination for the award was made by Charlotte Bacon’s grandparents, Dan and Lindie Bacon, who were deeply touched by the personal letter their family received at the time of the tragedy from Melanie Levi on behalf of the Cousins. For their charitable effort, the Cousins received a “pay it forward” award of $1,000 that is to be donated to the charity of their choice, and an all expense paid trip to Boston. The Cousins that Care includes Shawn Hansen, Shelby Townsend, Founder Melanie Levi, Laura Levi, Britney Levi, Cory Hansen and Thomas Levi. The Newtown Kindness Foundation was created for the sole purpose of encouraging kindness in children. More information is available at www.newtownkindness.org, or on the foundation’s Facebook page. This entry was posted in admin on February 28, 2013 by Marianne Christy. Regional outdoor writers Mike Wade and Leo Maloney are collaborating on their latest quarterly magazine, Adirondack Outdoors, which will premiere in April. 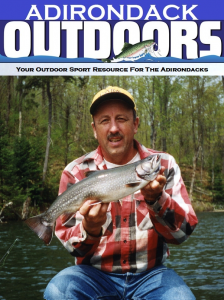 The magazine will feature articles on all types of outdoor sports in the Adirondacks including hunting, fishing, paddling, hiking, skiing and snowmobiling. It will also cover environmental topics as well as issues unique to the Adirondacks. Gary Lee, retired DEC Forest Ranger, author of Adirondack Birding and outdoor writer for the Weekly Adirondack, will also be writing a nature column for the publication. An article on loons will be included in the inaugural issue. The magazine will be available in hard copy and as an ezine. The Town of Webb’s 2012 Supervisor’s Annual Financial Report is currently on file at the office of Town Clerk Nanci Russell. Anyone desiring to review the report may do so during regular business hours at the town clerk’s office in the Town of Webb Municipal Building. The 2012 financial report is a 56-page audit that outlines the complete financials of the Town of Webb. It is required by the New York State Comptroller’s Office and must be submitted before Friday, March 1, 2013. This entry was posted in admin on February 28, 2013 by Dana Armington. At a special meeting of the Town of Webb Town Board on Monday, February 25, a resolution was adopted, subject to permissive referendum, regarding a lease agreement between the Town of Webb and St. Elizabeth’s Medical Center. It was resolved that the town board agreed and approved the terms and conditions of the lease and that the lease will commence on Friday, March 1. This entry was posted in admin and tagged Dana Armington on February 28, 2013 by Dana Armington. 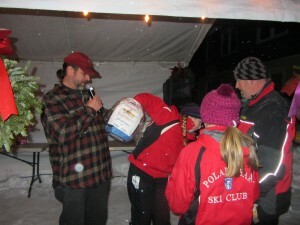 Mitch Lee holds the bucket of raffle tickets as Alex Sutherland draws the kayak winner during Inlet’s Frozen Fire & Lights Celebration. Alex’s father, Eric Sutherland is at far right. Trudy Menzzennto of Randleman, NC was the winner of the kayak that was raffled off prior to the Inlet Frozen Fire and Lights fireworks display on Saturday, February 23. The raffle was organized in memory of the late Kirsty Sutherland, with proceeds to benefit the Alexandra Sutherland Scholarship Fund. Menzzennto said she received the winning ticket as a Christmas present from her sister, Barb Trevvett, an area property owner. “Thank you so much to all who contributed to this fund to help Alex and to honor Kirsty’s memory, and to all of the volunteers and local establishments who helped to raise the $5,200 of funds to further Alex’s education. This is an awesome community!” said Connie Perry, co-organizer of the raffle. This entry was posted in admin on February 28, 2013 by admin. The Eagle Bay Fire Department Ladies Auxiliary will host its annual Cabin Fever Party on Saturday, March 2. The party begins at 5:30 p.m. at the Eagle Bay Fire Hall. The party includes a potluck-style dinner, with the members of the auxiliary providing a cold cut platter, condiments and beverages. Guests are asked to bring a dish to pass. Tickets for the 50/50 raffle will be available for sale and the winner will be drawn during the event. 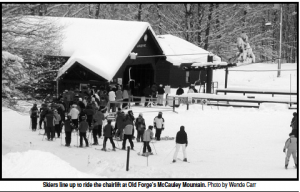 The party offers an opportunity for friends and neighbors to gather for some late winter fun. All are invited to attend.